Organic fertilizer comes from a wide variety of sources – animals, plants and minerals. Some natural fertilizers may be available for free, like compost and manure. Others are readily available online or at your local garden center, like liquid kelp. The use of organic fertilizer is not a substitute for good gardening practices. That said, a little of the right fertilizer at the right time can head off pest and disease problems. This means less work for the gardener and a better harvest. In the post, I'll cover some of my favorite organic fertilizers and how to use them. To get a better understanding of what is lacking in your soil and develop a soil building plan, you can send a soil sample into a lab for analysis. Your local Cooperative Extension Office should cover basic soil testing. There are other organic labs such as Crop Services International that provide test results and full organic soil building recommendations. If you want to “wing it” and use gentle fertilizers that feed the plants and soil microbes, try liquid fertilizers. Liquid kelp, fish hydrolysate, and compost tea provide a boost of readily accessible nutrients for plants and soil life. Organic fertilizers work better when you have adequate calcium in your soil, which many of us don't. Phil (The Smiling Gardener) says, “With all other nutrients, I don't recommend applying them without a soil test, but calcium is so important that I do add a small amount without testing.” Garden lime (CaCO3) adds calcium and raises the pH of the soil. Gypsum (Calcium Sulfate – CaSO4) adds calcium but doesn't raise pH. Gysum can also help reduce compaction and improve soil tilth. Why Use Organic Fertilizer? Shouldn't You Be Able to Grow Food Without Extra Inputs? If you're on this site, odds are you're trying to do more for yourself without buying extra products. The use of fertilizers, even organic, might seem to go against this. Unfortunately, most of us are dealing with soil that's far from perfect. Maybe it's thin, rocky, too much clay or sand, or used and abused. We don't have a magic wand to convert it to lush, micro-organism rich, thriving soil. Good compost is a great soil amendment, and green manure and mulching help build soil over time. While useful, those options may still not provide everything your plants need to give you the most nutrient dense, healthy food possible. Adding a good organic fertilizer quickly promotes stronger, pest resistant crops. We can increase tolerance to temperature and moisture variations and increase overall yield. Basically, you make an investment up front to get a very good return on investment at harvest time. The liquid fertilizers below cover a broad spectrum of nutrients. The other natural fertilizers listed cover nitrogen, phosphorous and potassium. There are many more natural fertilizer options, but many of these also provide other minerals and nutrients. A complete soil analysis will help you fine tune, but compost, manure and liquid fertilizers will cover the basics. Fast acting and easy to use, liquid fertilizers give crops a quick boost of nutrition. They can be added to water cans or irrigation systems. If I notice a disease or pest issue during the season, some liquid fertilizer combined with EM-1 is my go-to option. The fertilizer gets nutrients to the stressed out plant, and the EM-1 adds healthy bacteria to the mix. Kelp grows vigorously in the ocean. (Some giant kelp grows up to two feet per day.) This means it can be harvested with minimal impact on the ecosystem. Kelp contains various natural plant growth hormones and regulators that help plants deal with environmental extremes like heat, cold, wind, drought and disease. It also contains a wide variety of ocean minerals. Fish hydrolysate and fish emulsion are made from fish parts that used to be dumped. I've switched to fish hydrolysate because it's cold processed and retains more nutrients. Like the kelp, it's full of many nutrients. Fish fertilizer is an especially good source of nitrogen and phosphorus, both of which are important for many processes in plants. EM-1 isn't an organic fertilizer, per se, but it can help your organic fertilizer work better. We can apply all the organic fertilizers we want, but if we haven't established healthy biology in our soil and on our plants (i.e. beneficial microorganisms and a thriving ‘soil food web'), those fertilizers won't be as effective. Microbes break down fertilizers (plant food) into a form plants can use. (In the human body, bacteria and other microbes perform the same function. We can't digest food without gut microbes.) Think “plant probiotics“. They also colonize leaf surfaces to help crowd out problem microbes, like downy mildew and other fungal diseases. You can purchase ready made compost tea, or make your own with some finished compost and an old sock. Place your compost tea bag (or sock) in your water and let sit overnight. Water the next day as usual. You can also jump start the compost tea microbes with an aerator. (This works with EM-1, too.) With aeration, microbe populations flourish and help to build your soil web even faster than straight compost tea. Blood meal is high in nitrogen – high enough that it can burn your plants. Some folks mix it into the compost heap, some work it into the garden at planting time. Manure is my high nitrogen fertilizer of choice. Fresh manure may burn plants – plus it may have questionable microbes from the critters. It's best to age or compost your manure from several months to a year. What we often do in our garden is to add a layer of partly aged manure to a garden bed and let it sheet compost in place. The first year, we dig hills of squash or melons in at four foot intervals. (The seeds or plants go in a pocket of dirt placed in the manure, not directly in the manure.) The rest of the bed is covered with mulch or landscape fabric for the season. The vines sprawl and cover the bed. Vine crops tend to be heavy feeders, so they don't mind living in a compost heap. Rabbit poop and duck poop are less “hot” (less likely to burn plants). That said, I'd still avoid direct contact with the parts of plant you intend to eat, like leafy greens. Phosphorous is critical to photosynthesis and many other plant processes, such as root development, flower formation and seed development. It also makes plants stronger and more disease resistant. In legumes, it increases their nitrogen fixing capacity. Low phosphorous levels are often signaled by reddish-purple to leaves and low fruit set. Bone meal (ground up bone) is one of the most readily available sources of phosphorous. (If you slow cook your chicken broth for 24 hours, your bones will likely crumble into meal.) Bone meal is available commercially, and is worked in at planting time. Ground rock phosphate is another source of phosphorous. It releases slowly into the soil, so one treatment lasts about 5 years. Potassium helps water, nutrients and carbohydrates in plants get where they need to go. It makes grains and root veggies appropriately starchy, and increases protein content in plants. Potassium reduces respiration, water loss and wilting. Without enough potassium, growth is stunted and yields are reduced. Kelp meal is high in potassium, as well as other trace minerals. Sul-Po-Mag (sulfate of potash magnesium) provides slow release potassium. Greensand provides a wide range of trace minerals as well as potassium. Both kelp and greensand act as soil conditioners, helping to unlock nutrients already in the soil. Wood ashes are also high in potash, but can injure plants if applied too thickly. It's best to spread them thinly (no more than 5 pounds per 100 square feet), either in fall or very early spring, preferably with manure or compost. This gives the ashes time to mellow before planting. These fungi form relationships with over 95% of plants in nature. They wrap around plant roots and even go inside the roots, bringing water and nutrients to plants as well as protecting plants from root-feeding predators. In return, the plants give them food that they make during photosynthesis. It's a partnership that's really vital for optimal plant health. Unfortunately, in our gardens, these fungi are often lacking because of tilling, compaction, past pesticide and chemical fertilizer use, etc. But now we can bring them back in with powder that we rub onto our seeds and root balls when planting. We found Granular Endo Mycorrhizae easy to use during planting, and seeded it throughout our gardens and orchards. Mycorrhizal Fungi are critical support players in the micro-ecosystem. Think of the scene in Avatar where the ground lights up with millions of glowing blue threads. They've sort of like that, except they don't glow blue and you often need a microscope to see them. See Mycorrhizal Planet – Nurturing Fungi to to Build Soil Fertility and Support Plant Health for more information of the critical role of mycorrhiza. Recently rediscovered, biochar is sometimes called “The Secret of the Amazon”. Throughout the Amazon rainforest, there are areas of rich. black soil called “terra preta”. These fertility zones are man-made, and contain charcoal and pottery shards. Even after centuries, these zones retain amazingly high levels of fertility. For more information on biochar, see, “Biochar – Amazon Secret Rediscovered“. Even you you struggle to make compost, you can probably set up a worm farm for worm castings. Worm castings are high in humus (organic matter) and a variety of essential minerals including nitrates phosphorus, magnesium, potassium and calcium. 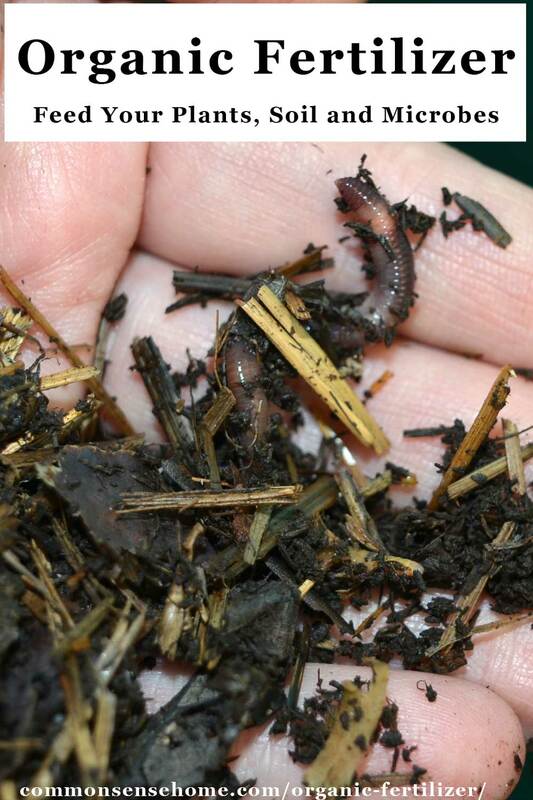 To learn more, check out, “Vermicomposting – How to Start an Earthworm Bin for Composting“. You can also purchase worm castings online or in garden centers. I could go on and on about organic fertilizers, but the post is already getting quite long. Basically, if it rots, you can probably use it to fertilize your garden. Just keep in mind that anything you use on your plants eventually gets into your food. They turn sewage sludge into organic fertilizer, but given the drugs and other toxins that end up in sewage, that's not something I'd want near my food. As mentioned earlier in the post, fresh manure comes with its own batch of microbes. Some e coli outbreaks have been traced to bacteria sucked up into the plants from contaminated water. You can't wash that off. When in doubt, compost first before adding to the garden. That will give time for the bacteria that grow in animals to be replaced with bacteria that thrive in dirt. If you have access to dregs from an apple press, or pond weeds, or spoiled feed – it'll all rot down and add something to the soil. Heck, you can let weeds grow and then chop them down for fertilizer. (Just don't let them go to seed.) Do watch out for anything that's been treated with herbicides. I've known more than one gardener who had their garden ruined by old hay that had herbicide residue. Use cover crops and mulch to protect and build your soil. Clovers and other legumes add nitrogen as well as organic matter. Try to avoid leaving soil bare. It's our job as gardeners to be stewards of the land, and part of that includes building a healthy biome. What's your favorite organic fertilizer or gardening tip? What soil challenges do you face? Leave a comment and let me know. Don't forget to check out the Gardening Index for tips on specific crops such as tomatoes and blueberries. 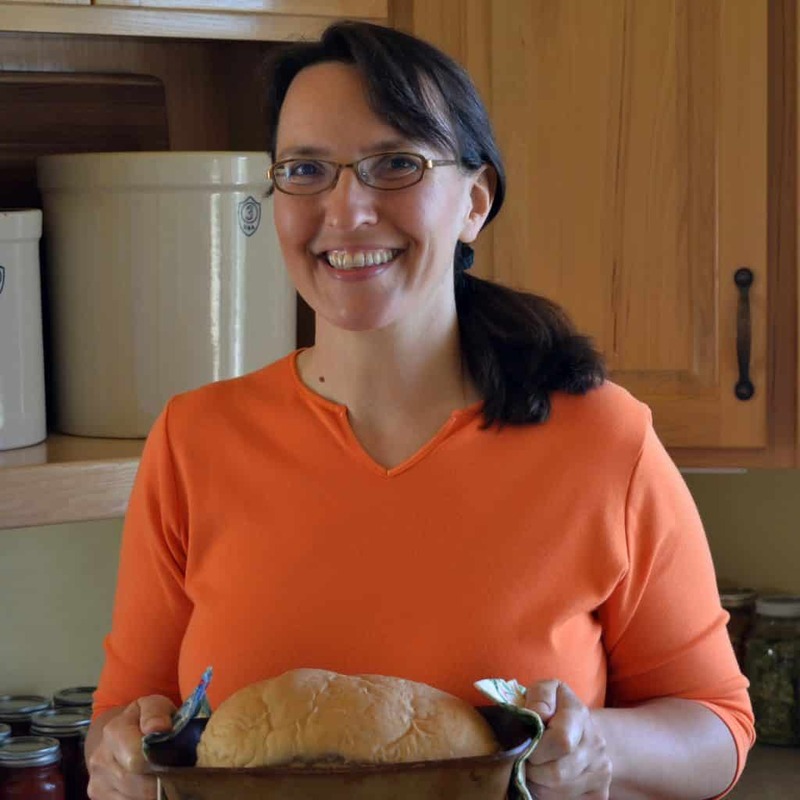 Laurie Neverman is the creator of Common Sense Home (formerly Common Sense Homesteading). She was raised on a small dairy farm in northwest Wisconsin, and worked in the family catering business as her summer job through high school and college. She has a BS in Math/ Physics and an MS in Mechanical Engineering with an emphasis in renewable energy. Her gardening adventures include companion planting, wildcrafting (using weeds for food and medicine), vertical gardening, herbalism and permaculture. Her family’s Green Built certified home includes an attached greenhouse, root cellar and canning pantry, which extend the growing season and allow them to store food for year round use. She hasn’t found a wild edible she wouldn’t try (including quackgrass wine), and grows over 100 varieties of fruit, vegetables, herbs and flowers in her garden each year. I I have one main question it is… Why do my seedlings always die when I put them into the ground. I do the tending and hardening off but I think it must be the clay of our soil because after about 2 weeks they are dead. Heavy clay can be very hard on plants. I think soil testing would be a very good investment. I just started learning about these exact organic fertilizers and would love to try them! Are coffee grounds good for a garden or are they too acidic? I put them on my blueberry bush and killed it! Coffee grounds should be near neutral pH, but they shouldn’t be used in bulk straight on plants because they may actually burn/stunt plants because of too much nitrogen, just like fresh animal manure. You can read more at “Science Daily – Coffee Grounds Perk Up Compost Pile With Nitrogen“. Addition: Do you make compost tea? If you do, do you add these nutrients to that? These would generally be used separately from compost tea, although that is another great fertilizer option. I surely could use something like this for my (mostly) brown thumb! I know this is not an outdoor plant question. I am having trouble keeping an aloe vera plant alive. Our long WI winter and not much sunlight did not help. Need tips, what to do when lower leaves get thin…dry up. Should I trim that off? When the plant,…leaves/blades, have separated…lowered or..going towards the side of the pot…is that the plant telling me something? When do I take pups, baby aloe vera off the momma plant? You can relocate babies at any time. Make sure you are using a light potting soil, like something for cactus or succulants, and don’t overwater. Use a balanced fertilizer once a month or so. I have been using empson salts. coffee & tea grounds and use egg shells. I enjoy your blog and read it daily. Thank you for this organic fertilizer giveaway. 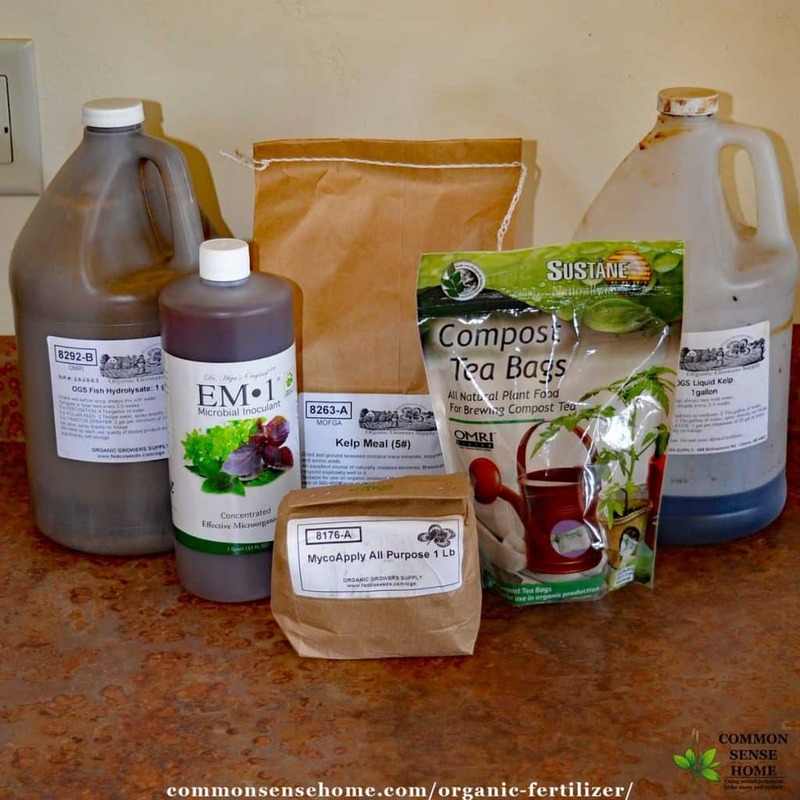 Do you have a DIY compost tea recipe? You may want to check out “How to Make Compost Tea“. Do you know if any of these products will work w/ a t-tape system? Because the emitters are so small & clog easily, I have had a very hard time finding organic fertilizers that can be used. I’d have to ask Phil about that. Will leave him a message. That’s what I think of after readingyour post. It all starts with your soil. Yep – feed the soil, not just the plants. It’s all alive and interconnected. This looks very interesting. Thank you. I have not been able to have a garden for a couple of years (due to illness in my family) I could sure use some help with my garden. These fertilizers look awesome! I’m fairly new to gardening and have never really fertilized. Is it really THAT important? Depending on your soil, you may be able to get an acceptable harvest with no added fertilizer. That said, most garden crops take nutrients out of the soil and don’t add much back in (legumes – peas and beans – will add nitrogen). Over time your soil will become depleted, and yields will decrease. Adding nutrients – however you want to do it – makes for stronger, more disease and pest resistant growth with higher nutrient content. You can do before and after tests with a refractometer to see a real difference after feeding. I am doing any good for my tomatoes by adding our eggshells to the soil? Generally, yes. A shortage of calcium can contribute to blossom end rot. What’s up with the black walnut tree and why do other trees nearby fail to thrive? Black walnut release juglone into the soil, which can be toxic to nearby plants. Read more at , “Black Walnut: The Killer Tree“. I would love to try these products on my garden. Thanks for a great giveaway. 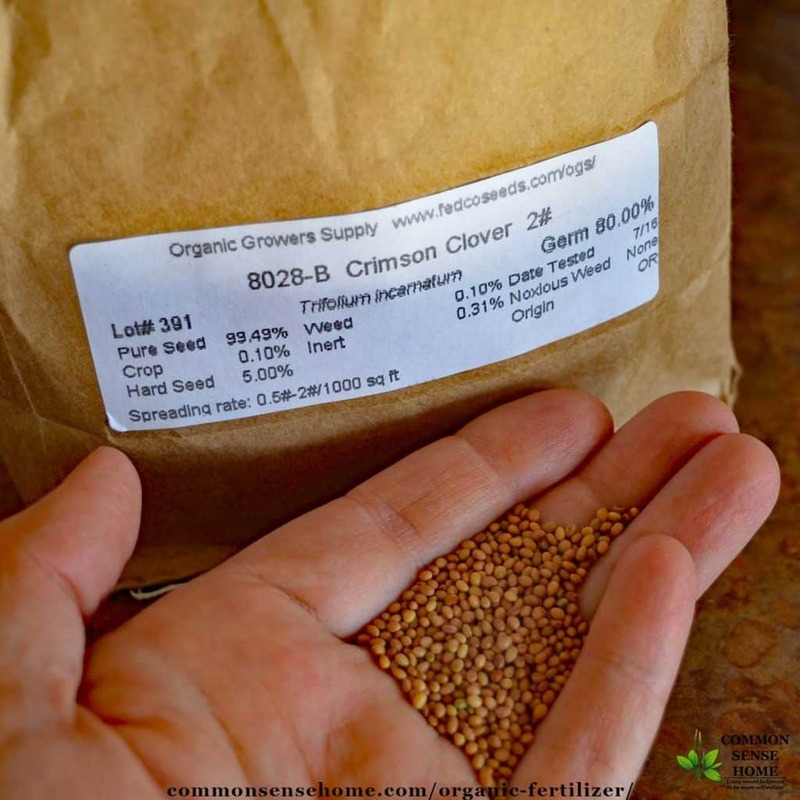 ORGANIC – The only way to fertilize! Is there a ‘best’ way to grow heirloom tomatoes in the Southeastern U.S. (FL) to help prevent disease(s) caused by heat and humidity? Out of my area of expertise, but you might try, “Growing Heirloom Tomato Varieties in Southwest Florida“, Florida Heirloom Seeds and Tomatoes for the South. Fabulous to test a variety! Love the contest! My summer squash grows great, nice and healthy…but the blossoms fall off and I don’t actually get any squash…help! I use compost and llama poop mostly. I also put pine needles on my strawberry bed. Our soil is very alkaline, and we have hard water. Wish I could do blueberries here in Idaho, but haven’t had any success. The giveaway sounds like a great way to try some new things and see how it works. I can’t wait to see your garden experiment updates! Squash bugs! I quit growing squash at my last home because they killed the plants before I got more than two or three fruits. This home is a new garden and I am trying again, but really worry. You can hand pick or hit them with the shop vac, but see the advice I gave to Trish about rooting in multiple locations and feeding intensively. I have been saving washed egg shells, to crush and add to my soil when I put in my heirloom tomatoes. Is this a good idea for calcium? I thought I had read this somewhere. You betcha! I add eggshells to my planting holes every year. You can read about how I grow my tomatoes in the post “How to Grow Tomatoes Organically“. Hello, I love the blog! Do you have any strategies for fighting off the squash vine borer? My zucchini and winter squash have been decimated two years in a row now and I’m tired of it. Surgery doesn’t really work, my vines die anyway. I’ve read about floating row covers but I’m not sure how to use them properly. If you have a successful plan to thwart them, please do share. Thanks for a great giveaway! Squash vine borers do a lot of damage, and I have only found the surgery thing helpful if I have a very minor infestation. I don’t like fussing with floating row covers, because our high winds blow them all over the place. Also, you have to remove them to let pollinators in and I have found that I am inevitably running behind in the garden, so I know I’d get my timing off. My best strategy for dealing with these guys is to turbocharge the squash plants to make them more resistant to everything. Add a small mountain of compost and manure to their planting area, and as they grow, cover sections of vine with compost or rotten manure so they root out in multiple locations. This way, if they main stem is badly damaged, the secondary and other root systems can take over feeding the plant. Foliar feeding a few times during the season to hit the plants with easily absorbable micronutrients makes them generally more robust and resistant to pests and disease. I’d like tips for growing large onions! Make sure you are growing the right onions for your area, and if you are a northern grower, you need to get them in as early as possible. They will form layers until solstice, and then as the days gets shorter, they will switch to bulking up the layers. If they don’t have much time to grow before summer solstice, they will never bulk up. Don’t use too much nitrogen (no fresh manure), but loose soil with some nice compost or rotten manure is good. Watch your weed competition, and make sure they get plenty of water. My new garden can use all the help it can get! I’m so excited to have discovered your website. I’ll be spending lots of time here. Gardening here is a real challenge — little rain, high pH soils and brutal winds make me wonder how anybody ever grows anything. Looks like I might get some help here! Hi Mary Beth. Don’t forget to check out the our Gardening Board on Pinterest. I write article here from my own experience, but there I pin a variety of posts for gardening in different conditions. I transplanted my hydrangea to my new home from my old one (same state and city) and it mostly looks healthy except for on the leaves around the edges it is brown. Could this be from some kind of deficiency in my soil or something else? Check out this article, “Dry, Brown Leaves on Hydrangeas” to see if anything fits what you’re seeing on your plants. Here’s my gardening question… will the neighbors EVER do anything about their weed situation??? I would like to know how to get more elderberries to grow on my property. I have one that the birds get to first and had another that was killed by weed killers sprayed by the county for weeds. I have complained but too late now. You might try propagation by cuttings. Read more at http://www.omafra.gov.on.ca/english/crops/facts/95-005.htm#Propagation. I would like to try it on my fig trees. Thanks. I need help with my raspberry plants. I am losing many canes to some kind of blight. You may want to check out “How to Grow Raspberries” or “Diseases of Raspberries“. When is the best time to add fertilizers to your plants? It varies some by plant, but generally you want to use them during times when you’re encouraging vigorous growth, like spring into summer, not heading into dormancy so you don’t trigger new growth that will be damaged by cold. we have a good size garden, just the last couple years we paid attention to our planting. now doing heirloom & organic. but i’ve never fertilized! do they have a book called Fertilizing for Dummies??? I don’t want to use the chemical crap they have out there! I’m pretty sure this is in the free course that Phil is offering through his site. Hm! Well now I know, sadly after all of my seedlings have died off on me. Haha, thanks for the post! Scroll through the comments to find the other discussion of squash trouble. Also note – feed the soil and the plants. Back at our last house, we had heavy clay soil, and I struggled for years trying to build up the fertility, but it still wasn’t great. One year, we got cucumber beetles. They brought in bacterial wilt. After that, I could never grow vine crops again. They always got sick and died. Here, I’ve had cucumber beetles show up, but they generally do very little damage – unless the plants are already stressed by problem growing conditions such as drought. Enrich your soil, foliar feed the plants while you work to build your soil, and you should see more resistance to pest problems. I look forward to any and all information to invest in soil and our health. What is the best way to keep bugs from eating everything? Grow stronger, healthier plants. No joke – I have seen this in my own garden over the years. When plants are struggling just to grow, bugs show up and things go downhill rapidly from there. When I have healthy, vigorously growing plants, the same bugs show up, but generally do little damage and are easily controlled by hand picking or bait traps. What the video at the end of the “How to Grow Tomatoes” post to see what’s possible with a whole soil/plant fertility program. I have a lot of trouble with scale on my bay tree; I’ve tried a lot of different natural solutions but nothing has worked so far. looking forward to seeing the results of your test garden.